It’s an old – and not always funny – joke that during a divorce a couple’s friends will be divided up like any other asset. This means that some people with whom you may have been quite close will now no longer be such a large part of your life and you will need to make a concerted effort to make some new friends. If you haven’t had to think about meeting new people for a long time this may seem scary, but before you decide to become a hermit just take a deep breath and realise that this is the perfect opportunity to do something new and have some fun. With a little bit of planning and the guts to get out and meet new people you should be back to living it up in no time. Before you begin thinking about how to make new friends, think about the type of new friends that you would like to make. If you need to, write up a list of the qualities you’d like your new friends to possess. Tired of always footing the bill? Make financial solvency a priority. Tired of being the shoulder to cry on? Think about adding coping skills as well. Want to talk politics/art/magic tricks? Go ahead and add that too. This is your time to come up with the ideal pal, so allow that to be whatever you want it to be. Just remember, however, that no one is really perfect so do not expect to find all of your desired qualities in just one person. Instead, be on the lookout for many interesting individuals, all of whom might satisfy certain parts of your requirements. Once you know what kinds of friends you’re looking for you need to get out and meet and greet others until you find them. 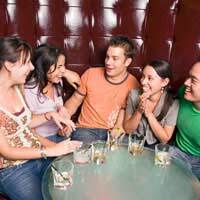 Some organised events like adult social clubs and mixers flourish for exactly this reason, but if you’re shy about advertising your desire for new friends there are more subtle methods available as well. Turning up to a church meeting, attending a book club, enrolling in a night course and even joining a gym are all ways of getting out of the house and meeting new people. You may end up needing to extend further social invitations, such as asking others if they’d like to get a coffee after a meeting or maybe taking in that new flick based on a book you’ve all read, but don’t let the fear of rejection stop you. Since you all choose to spend your spare time doing similar things, chances are good that you share similar tastes and spending more time together will be appealing to more than just you. No matter how much fun you have meeting new people and making new friendships, don’t forget your old friends during this time. Some people who go through a divorce have trouble making plans with older friends, whether it be because the friends remind them of their marriage, because they worry that their friends want to remain friendly with their ex, or because it is easier to spend time with people who know nothing about their home life. Even if this is the case, you can’t throw away cherished friendships simply because you are going through a rough time. Friends want to help each other when the going gets tough, so let your friends do that for you. You’ll all be glad that you did.